Its an Insteon embedded control device I bought to test out Insteon devices. Its from a company called Universal Devices Inc. This little device is very cool. It gives you full smart home control from anywhere - when I say full.... I really mean full. I will give you a run down of why I am using it and what it can do. It all started many years ago with a few little devices I bought that plug into a wall electrical outlet and let you control the On/Off and dimming of the outlet. They were called X10 devices and are simple devices that send messages over the power lines in your house. They worked OK but had a few glitches due to the X10 power line carrier (PLC) technology used. 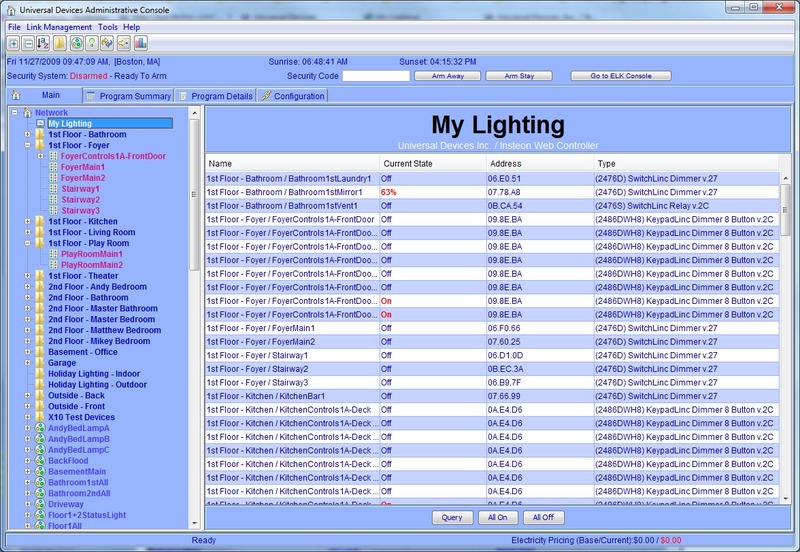 With X10 I am able to control lights and devices all around my house with remote controls or from my computer. So, along comes a home reno and I foresee the need for wiring my addition as "Smart" and controllable as possible - full home automation. I chose to look at what is described as a new and better version of X10 called Insteon developed by SmartLabs. 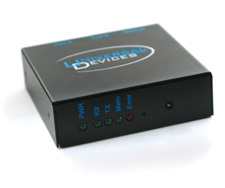 It is a full peer-to-peer messaging protocol that uses both PLC and RF to transmit its messages to its devices. Its faster than X10, more reliable, encrypted, and has better support! Take a click through some of the above Insteon links or go to www.smarthome.com. Enough about Insteon, I want to talk about the Universal Devices ISY-99i Web controller. I went out and bought some test devices to see if they will do what I need in my basement addition. Most of these capabilities are provided by the Insteon devices, however, the web access and programmability is not. You need to be running a computer full time with the software to do all of this. That is where the ISY-99i comes into the picture. It is a purpose built embedded computer specifically to control Insteon, X10, and A10 devices, and boy does it do a good job. It serves up a web page that provides access to all the controls, as well as a Java WebStart Administrative Application. And it all works right out of the box. Its a bit bigger than a deck of cards. I now have a programmable interface that gives me full customizable control of all my devices from any type of computer OS via the Java admin application. BUT Wait It Gets Better! This thing has plug-in modules to add extra capabilities such as better X10 control, Enhanced network capabilities, climate modules, and enhanced electricity usage tracking and control. It also has Free REST, Web Services, and Java SDK libraries. Yea!!! a Java SDK and it is very robust! This little box does everything it needs to do and more. I have already wrote a little desktop control pad application called ISY99Buttons using the Universal Devices JSDK. You can it via WebStart ISY99Buttons right now. If you have an ISY-99i and have not changed the default user/password (admin/admin), it should automatically find it, pick up all your devices and create a little control pad of buttons for each one! If you want to look at the source.... Its available too. See my subversion repository (http://svn.webarts.bc.ca/astroVersion) or click on the files attached below. Right now the user/pass is hardcoded into the IsyInsteonClient.java class file. Change it, recompile, and rerun the ISY99Buttons.java class as needed. After having tested this out on a smaller scale, I have fully embedded Insteon and the isy99i into my newly renovated house. My experience has been outstanding! and the support from UDI is 100% - extremely helpful tech support, active web forum with lots of end-user help and examples. And the price for all this is peanuts compared to other systems (without all that expensive control wiring needed).